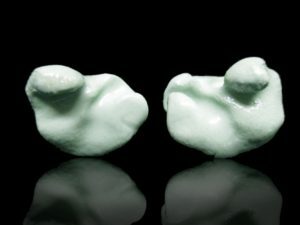 Custom Earplugs are molded to the shape of your ear to ensure a perfect fit and plugs that will never fall out. The last set of earplugs you’ll ever need. Standard stye Custom Earplugs is an Asheville local-only service because we do your ear impressions, shape them and cover them in a special material to make them into earplugs. If you are not local to Asheville and also aren’t willing to travel here, you can get custom earplugs at any audiologist in your area. If you are local, you can come get free Ear Impressions (included). If you order a pair of In-Ear Monitors, you get a free pair of Custom Earplugs!